The Sevier River (pronounced "severe") is a 385-mile (620 km)-long river in the Great Basin of southwestern Utah in the United States. Originating west of Bryce Canyon National Park, the river flows north through a chain of high farming valleys and steep canyons along the west side of the Sevier Plateau, before turning southwest and terminating in the endorheic basin of Sevier Lake in the Sevier Desert. It is used extensively for irrigation along its course, with the consequence that Sevier Lake is usually dry. The Sevier River drainage basin of 11,574 square miles (29,980 km2) covers more than 13 percent of Utah and includes parts of ten counties, of which the river flows through seven. The name of the river is derived from the Spanish Rio Severo, "violent river". :335 The Sevier is the longest river entirely within the state of Utah. The Sevier River is formed by the confluence of Minnie Creek and Tyler Creek in Long Valley in Kane County. The headwaters are at an elevation of 7,310 ft (2,230 m) between the Markagunt Plateau (on the west) and the Paunsaugunt Plateau. :82 The river flows north through a wide valley into Garfield County passing Hatch and Panguitch. It then flows through the narrow, 5-mile (8.0 km) Circleville Canyon and enters Piute County at the town of Circleville, and is joined by the East Fork Sevier River at Kingston. Immediately north of Kingston, it is dammed to form Piute Reservoir. The Sevier continues north past Marysvale and through Marysvale Canyon (or Sevier Canyon) into Sevier County. At Sevier the river enters the agricultural Sevier Valley, a 50-mile (80 km) long basin between the Pavant Range on the west and the Sevier Plateau to the east. In the valley, the Sevier River flows generally northeast, passing the towns of Joseph, Elsinore, Richfield, Aurora, Salina and Redmond,:66–67 then flows north into Sanpete County where it picks up the San Pitch River near Gunnison. In Juab County the Yuba Dam forms Sevier Bridge Reservoir, which also extends into Sanpete County. Below the dam the river flows north then turns abruptly west through Leamington Canyon, between the Canyon Mountains and Gilson Mountains, into Millard County. The river flows southwest across the Sevier Desert, where it is used heavily for irrigation in the Delta area, and is dammed at the DMAD and Gunnison Bend reservoirs. The river is essentially dry for the last 30 miles (48 km) below Delta, through its confluence with the also dry Beaver River before reaching the intermittent Sevier Lake bed. The Sevier River drainage basin is on the border of the Basin and Range Province and the Colorado Plateau, The north and west parts of the basin are defined by long linear mountain ranges such as the Pavant and Canyon Mountains. :58–59 To the east and south rise high plateaus and block-shaped mountain ranges, chief of which are the Wasatch and Sevier Plateaus to the east,:58, 67 and the Paunsaugunt and Markagunt Plateaus, the Pink Cliffs and the Tushar Mountains to the south. :82–83 The entire basin is at high elevation, with the highest point at 12,174-foot (3,711 m) Delano Peak in the Tushar Mountains. There are twelve other peaks in the basin rising more than 11,000 feet (3,400 m). The lowest point is at Sevier Lake, 4,524 feet (1,379 m) above sea level. The basin experiences a continental climate ranging in character from semi-arid to alpine. Precipitation – ranging from 6.4 inches (160 mm) in the desert valleys to more than 40 inches (1,000 mm) in the mountains – falls largely as snow during the winter and early spring, and as monsoon thunderstorms in late summer and early fall. As of 1999, there was an estimated annual runoff of 823,000 acre feet (1.015×109 m3) in the Sevier River basin, but only about 32,900 acre feet (40,600,000 m3) of that reached Sevier Lake, and mostly in wet years. Even before irrigation, however, not all of this water reached Sevier Lake due to large evaporation losses in the Sevier Desert. The Sevier River basin is bordered to the south by the drainage basins of Virgin River, Kanab Creek, Paria River, and Dirty Devil River, all tributaries of the Colorado River. To the east it is bordered by the Price and San Rafael River basins, tributaries of the Green River, which flows into the Colorado. On the north it is bordered by the Utah Lake–Great Salt Lake basin, and to the west it is bordered by the Great Salt Lake Desert basins. Most of the Sevier drainage is rural, composed of small farming communities. The largest town is Richfield, with a population of 7,723 as of 2016. About 69 percent of the land is federally owned, much of that in national forest lands such as the Manti-La Sal, Fishlake, Dixie, and Uinta National Forests. The basin also includes parts of Bryce Canyon National Park and Cedar Breaks National Monument. About 23 percent of the basin is privately owned and 8 percent is owned by the state of Utah. Surface rock in the Sevier River basin is composed mostly of Tertiary igneous rock, and sedimentary rock ranging in age from Jurassic to Quaternary. This is underlain by marine sedimentary rock including thick limestone layers, which accumulated prior to the Jurassic when the western US was part of a shallow sea. Uplift during the Jurassic and Cretaceous thrust western Utah above sea level for the first time. Between 100 and 80 million years ago the Sevier Orogeny created mountains much higher than those found in western Utah today. The Sevier Desert was formed starting about 20 million years ago due to crustal stretching that lowered the local terrain. Another period of uplift occurred towards the end of the Tertiary, about 12–2 million years ago, creating most of the present-day mountain ranges and plateaus. Significant vertical displacement has occurred on several north-south faults in the basin. The Sevier Fault and Elsinore Fault run mostly parallel to the upper Sevier River above Gunnison, and the Paunsaugunt fault runs in the same general direction further east, passing through Bryce Canyon. The Sevier Valley (and the Sanpete Valley north of it) is a graben or down-thrown block of land between the Sevier and Elsinore faults, with deep alluvial deposits filling the valley bottom. Groundwater basins occur mostly in the alluvial valleys and have been estimated to hold up to 5.5 million acre feet (6.8 km3) of water. 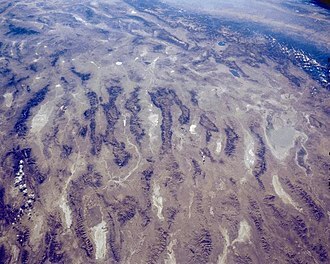 Aerial view of the Little Sahara sand dunes, which were formed from Sevier River sediments carried by wind. Large mineral deposits occur in various areas of the basin, including coal in the Salina area, beryllium in the Delta area, and gypsum in the Richfield area. The dry Sevier Lake bed as well as deposits in the Redmond area are a major source of salts including halites and potassium sulfates. Historically, uranium was mined near Marysvale. Above Marysvale Canyon, the colorful formations of Big Rock Candy Mountain are a widely recognized geological site in central Utah; yellow, red and orange bands are the result of jarosite, hematite and pyrite while white bands result from alunite and kaolinite presence. 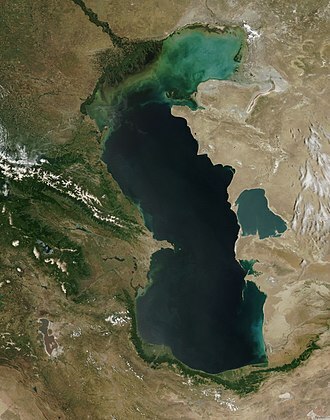 During the Pleistocene Ice Age and other preceding ice ages, the Sevier River flowed into Lake Bonneville, which covered more than 20,000 square miles (52,000 km2) of the eastern Great Basin. The Sevier Valley was underwater as far upstream as Richfield. As the lake receded with a drying climate at the end of the ice age, what is now Sevier Desert became an independent lake, which drained into Great Salt Lake via a now dry channel in Millard County north of Delta. As Sevier Lake shrank, the Sevier River formed a large delta at its mouth, hence the name of the modern town. Soils become progressively more alkaline and saline closer to Sevier Lake, the result of the river transporting minerals downstream over millennia as the lake receded. The largest sand dunes in Utah, found in Little Sahara Recreation Area, were formed from Sevier River delta deposits moved over thousands of years by prevailing winds. There has been relatively recent volcanic activity in the Sevier basin between 1000–1500 AD, when basalt flows occurred on the Markagunt and Paunsaugaut Plateaus and in Pahvant Valley. One of these flows dammed a valley and formed Navajo Lake. Due to the semi-desert climate, the valleys of the Sevier River basin were historically mostly grassland and shrubland, with the seeds of Oryzopsis hymenoides (Indian ricegrass) being an important food source for Native Americans. Many valley plants, such as greasewood, shadscale and saltgrass are adapted to higher salt content in the soil. The valleys have been heavily modified for farming and grazing, and much of the remaining native grassland has been taken over by invasive species such as junegrass and the ubiquitous Russian thistle (tumbleweed), as well as native sagebrush whose range has expanded into formerly grassy areas. The Sevier River historically supported large areas of wetland and riparian zones, especially where it formed a delta at the northern end of Sevier Lake. Many of these habitats have been replaced by agriculture, but there are still an estimated 92,000 acres (37,000 ha) of wetland and aquatic habitat extant in the basin, of which about half is located in Millard and Sanpete counties alone. The upper reaches of the river and many mountain tributaries are home to cutthroat trout, brook trout and rainbow trout, of which cutthroat are the only native species. Much of the lower part of the river is a warm water fishery with brown trout, carp, suckers and channel catfish. Common fish found in reservoirs are walleye, smallmouth bass, yellow perch and northern pike. Because the Sevier River provides some of the only water-based habitat in a large desert area, it is used by abundant migratory waterfowl including geese, ducks, cranes and shorebirds. Gunnison Bend Reservoir is visited by thousands of snow geese each spring. Other birds common to the Sevier basin include pheasants in agricultural and riparian areas; chukars in foothill areas and grouse in the hills and mountains. There are also multiple raptor species, including bald eagles and peregrine falcons. Fur-bearing animals such as beaver and river otter were once widespread before being trapped out in the early 1800s, and predators such as kit foxes, coyotes and cougars still roam less populated areas of the basin. In the high mountains and plateaus above 8,000 feet (2,400 m) elevation, conifer-aspen forest prevails in the alpine zone with forests of white fir, Douglas fir, ponderosa pine, red cedar, spruce and quaking aspen. Engelmann spruce, limber pine and the occasional bristlecone pine are found at the highest elevations. Precipitation is sufficient to support many perennial streams and springs, which nourish mountain meadows and numerous small high elevation lakes. Large wildfires once regularly occurred on the mountains and plateaus, but since the beginning of the 20th century fires have been heavily suppressed. The high country is home to small mammals such as ground squirrels, red squirrels, snowshoe hare, chipmunks and porcupine. Pika and marmot are found near mountain peaks and flying squirrels can be found in the Navajo Lake area. Larger mammals include mule deer, pronghorn (antelope), black bear and cougar. Also once found in the area were the Rocky Mountain bighorn sheep, bison, grizzly bear and timberwolves which were all hunted to extinction in the 1800s or early 1900s.The deer population was nearly extirpated during the era of western settlement, although it has since recovered. The foothill and transition zones support a wide variety of vegetation types. Small hardwoods such as gambel oak, serviceberry, mountain mahogany, maple and scrub oak tend to occur at elevations of 7,500 to 8,500 feet (2,300 to 2,600 m) just below the boundary of the alpine zone, but still high enough to receive significant precipitation. In the lower foothills, pinyon–juniper "pygmy forest" mixed with areas of grassland and sagebrush occur between 5,500 to 7,500 feet (1,700 to 2,300 m) in elevation. Paleo-Indians were present in southwestern Utah as early as 10,000 BC, when the climate was much wetter during the Pleistocene ice age and the Sevier basin was partially occupied by pluvial Lake Bonneville. Wetlands along the shoreline and a much fuller Sevier River provided abundant habitat for fish and wildlife, supporting a larger human population. Lake Bonneville had dried up by about 7000 BC, and the aridifying climate limited plant and animal resources. The Desert Archaic culture, characterized by small semi-nomadic bands, succeeded the Paleo-Indians but it is not known whether they are the descendants or an entirely different group. The Desert Archaic culture declined around 1500 BC, for reasons that are uncertain but have been attributed to massive flooding at that time. Beginning about 500 AD, people of the Fremont culture inhabited the Sevier basin; a Fremont village site called Nawthis has been discovered in the Salina area dating to the years 800–1150 AD. There is evidence that these early peoples used irrigation for their crops – primarily corn, beans and squash. Fremont remains have also been found in southern Sevier County near Clear Creek. This site is now preserved as Fremont Indian State Park. The Fremont culture disappeared around 1300 AD, possibly due to an extended drought. The ancestors of the Ute, Southern Paiute and Goshute peoples who populated the Sevier River basin immediately prior to European arrival migrated into the area possibly centuries after the decline of the Fremont culture. The traditional lands of these three peoples converged on the Sevier River delta in what is now Millard County. The Utes dominated most of the area traversed by the Sevier River including the Sevier Valley and the headwaters of the river. 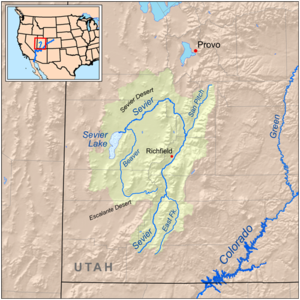 Notable sub-groups including the Pahvant Utes who lived around Sevier Lake, the Sanpits Utes from whom the name of Sanpete Valley and Sanpete County is derived from, and the Moanunt Utes who lived on the upper Sevier River. The Paiutes lived to the south and west of the delta, and the Goshutes inhabited drier areas so the northwest. Settlers William Wolfskill and George C. Yount noted some Native Americans who called the river the Pooence. The first Europeans to see the river were the Spanish missionaries Francisco Atanasio Domínguez and Silvestre Vélez de Escalante who led the Dominguez-Escalante expedition of 1776, trying to find a way to Monterey, California from Santa Fe, New Mexico. They arrived at the Sevier River on September 27, two days after leaving the Utah Valley, and camped at a location near the present day town of Mills. They named the Sevier River El Rio de Santa Isabel and gave the name Laguna de Miera to Sevier Lake. :335 However, the expedition was unable to find a way further west across the desert and was forced to turn back to Santa Fe. The expedition's cartographer, Don Bernardo Miera y Pacheco, sketched a map showing an outlet from Sevier Lake to the Pacific Ocean, which may have given rise to the myth of a Buenaventura River draining the Great Basin to the sea. The river was a major trade corridor during the late 18th and early 19th centuries, in no small part due to the route from Santa Fe opened up by Dominguez and Escalante. The Spanish traded manufactured goods and guns for furs, hides, horses and slaves from the Native Americans. Most of these slaves were Paiutes that had been captured by more aggressive Ute bands. 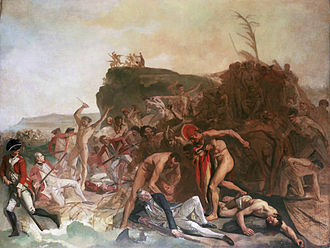 The river's present name probably originated in 1813 with Spanish traders Moricio Arce and Lagos Garcia, who ran into trouble with the Utes (supposedly when they rejected an offer by the Utes to sell them slaves) and escaped to a stream they called Rio Severo, Spanish for "violent". In 1821, the Sevier River basin became Mexican territory following the Mexican Revolution. Mountain man William H. Ashley explored the area in 1825 in search of beaver; the river was dubbed the "Ashley River" by Jedediah Smith in Ashley's honor. :335 Smith is credited with blazing a connection between existing Native American trails through the Sevier basin in 1826; this became part of the northern branch of the Old Spanish Trail, following the middle and upper parts of the river. John C. Frémont traveled along the Sevier River on his 1844 exploration of the Great Basin, which confirmed that the Sevier and other Great Basin streams had no ocean outlet and the rumor of a "Buenaventura River" was no more than a myth. During the 1830s and 1840s the fur trade was in full force with thousands of beaver and otter taken from the Sevier River and its tributaries; most trappers were Native Americans although there were also many of British, French and Spanish origin. The slave trade also remained a major if controversial business and only ended after the Mexican–American War in 1848, after which the Sevier River became part of Utah Territory. The first Mormon settlers arrived in the Sevier Valley in late 1849 under the direction of Brigham Young, but they and other whites passing through the region soon clashed with Native Americans. Sometime in early October 1853 a party of California-bound emigrants opened fire on a group of Pahvant Utes who had come to their camp to trade, killing one. In retaliation, on October 26, 1853 the Pahvants attacked a railroad survey crew led by Captain John W. Gunnison, killing eight members of the party near what is now the town of Delta. Despite the massacre, immigration continued with 30 Mormon families settling in the Richfield area in 1864, followed by 100 more the next year, further straining relations with the tribes. Between 1865 and 1872 more than 150 violent confrontations occurred between Mormon settlers and various Native American groups including the Utes, Paiutes, Apache and Navajo, a period now known as the Black Hawk War after Timpanogos chief Antonga Black Hawk. Livestock grazing had decimated the local grasses whose seeds were a staple food for Native Americans, forcing them to raid white settlements and steal cattle for food. By June 1866 most of the settlements had been abandoned as the fighting increased. One of the bloodiest single episodes was the Circleville Massacre near the upper Sevier River, in which 26 Paiutes were killed by white settlers after an earlier attack by Ute warriors, despite the fact that the Paiutes and Utes were enemies. In total, at least 70 whites and an unknown number of Native Americans were killed. The tribes were ultimately defeated with the intervention of the US government in 1870, although minor confrontations and skirmishes continued until about 1872. Most Native Americans in the area were moved to the Uintah Reservation in northeastern Utah. Many resisted the move, with several Ute bands traveling back to the Sanpete Valley early in 1872. Their presence alarmed Mormon settlers, as the Utes expressed discontent with conditions at the reservation. After the federal government sent additional supplies to the Uintah reservation, the Utes retreated. By summer 1872 many towns in the area had been resettled, and the white population increased rapidly for a number of years. During this time, Richfield grew into the largest city in the Sevier Valley, sometimes referred to as "the hub of Central Utah". The Deseret Telegraph was extended from Salt Lake City as far as Monroe in 1872. Development was slower to reach the upper Sevier country south of Marysvale Canyon, which was mostly ranching country although it would soon be the location of significant mineral strikes. Notorious outlaw Butch Cassidy grew up on a ranch near Circleville during the 1870s, where he "learned to be a cowboy first and, later, how to put his brand on other peoples' livestock." The first irrigation along the Sevier River was established in the spring of 1850, on the Sanpete County stretch of the river. Irrigation in Millard County began in 1859. The first storage reservoir in the Sevier basin was Scipio Reservoir, constructed in 1860. In 1865 in Sevier County, Mormon settlers dug the Richfield Irrigation Canal in just five weeks using only hand tools. Other farming towns were established along the river particularly after the Black Hawk war ended in 1872. A more ambitious project was the Tropic Ditch, which diverted water 15 miles (24 km) from the East Fork of the Sevier River through what is now Bryce Canyon National Park to the town of Tropic. Agriculture was made difficult by frequent flooding of the Sevier River. In June 1909 heavy snowmelt broke the Gunnison Bend Dam and flooded the town of Deseret under three feet (1 m) of water. It was not until about 1912 when the river was finally controlled by major reservoirs upstream. The division of water rights became an issue as the population increased, due to limited water supplies during the dry season. In one particularly dry year some residents in Milliard County "were so angry they hired a posse in an unsuccessful attempt to remove upstream dams." In 1900 the Higgins Decree established a commission to allocate water in the lower Sevier River. The 1936 Cox Decree established allocations for the entire Sevier basin. Heavy water use led to the drying up of Sevier Lake as early as 1880; dust blowing off the dry lake bed has become a persistent source of particulate pollution as far as Salt Lake City. However, the river and lake can still fill after major floods. In the especially wet season of 1982-1983, the melting of a record snowpack overwhelmed the reservoir system which had not been designed for flood control. Bridges, roads and diversion structures were washed out, and the DMAD and Gunnison Bend dams were partially breached. By May 1984 more than 1.5 million acre feet (1.9 billion m3) of water had flowed into Sevier Lake, temporarily inundating the dry lake bed 35 feet (11 m) deep. Along with agriculture, the Sevier basin has had a long history of mining and resource extraction, which continues in some areas of the basin today. Coal, rock salts and other minerals have been mined from the Salina area since the 1870s. In 1871 Mormon settlers reportedly found "anthracite coal in almost inexhaustible quantities" in Salina Canyon. In 1891 the Sevier Railroad, a branch of the Denver and Rio Grande Western Railroad (D&RGW), reached Salina, and the town soon became the shipping point for both coal and agricultural products from the Sevier Valley. Much of the coal mined in the area is nowadays shipped to the Intermountain Power Plant, which was completed near Delta in 1986. The 1,900 megawatt power station consumes two million tons of coal and draws 20,000 acre feet (25,000,000 m3) of cooling water from the Sevier River each year. In 2017 the Intermountain Power Agency announced it would be converting the plant to natural gas operations. Gold was mined at several places along the river starting in the late 19th century. In 1896 the Sevier Railroad was extended to the gold mining area of Belknap and in 1900 tracks were laid through Marysvale Canyon to reach the diggings around Marysvale, with the line thereafter known as the "Marysvale Branch". 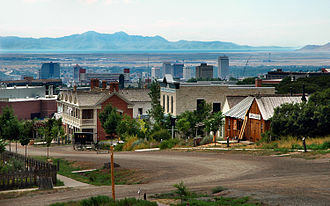 The boom town of Kimberly in the Tushar Mountains was one of the largest gold mining camps in Utah. Other boom towns of the period included Bullion City, Webster and Alunite, the latter of which produced significant quantities of aluminum ore. Uranium was first discovered in Piute County in 1948. During the height of the Cold War in the 1950s and 1960s, large amounts of uranium were mined along the upper Sevier River near Marysvale. The Marysvale district was fraught with health and environmental issues since early on; in 1951-52 inspectors in a Marysvale mine found radiation level 1,500 times above what was considered safe. Many of the miners were Navajo people who were often sent to work without any protective clothing or masks. In the following decades, many former uranium miners died of emphysema or various forms of cancer. The state of Utah later spent $500,000 closing down two hundred mines in the district. Trains stopped running regularly on the Marysvale Branch in 1972, and in 1983 heavy flooding washed out much of the tracks along the Sevier River. That year the Thistle mudslide near Spanish Fork severed the northern end of the line, which was subsequently abandoned by the D&RGW. The Sevier River is extensively dammed and diverted to serve more than 350,000 acres (140,000 ha) of farmland. Most of the basin is used for beef production, although there is a major turkey industry in Sanpete County. For the purpose of water distribution the basin is divided into upper and lower sections, with the dividing point at Vermillion Diversion Dam near Richfield. There are 175 irrigation companies in the Sevier River basin, with 72 of them serving over 1,000 acres (400 ha) each. The Sevier River Water Users Association is responsible for regulating water use in the river system, and monitors reservoir storage levels, canal diversions and stream flows. Total water use in the basin is more than 1 million acre feet (1.2 billion m3) annually, with more than 60 percent dedicated to agriculture. This figure is higher than the naturally available water supply since most of the water is used more than once. Due to the repeated reuse of agricultural return flows, salinity is a chronic issue in the lower Sevier River. As precipitation tends to vary greatly on an annual basis, up to 480,000 acre feet (590,000,000 m3) of water can be stored in surface reservoirs, with the largest three – Sevier Bridge, Piute and Otter Creek – accounting for 75 percent of that capacity. Although small reservoirs such as Scipio, Panguitch and Gunnison Bend had been built starting in the 1860s, water demand was so high by the 1890s that planning began for much bigger dams and reservoirs. Otter Creek Reservoir was constructed between 1897 and 1901 by a consortium of ten irrigation companies in the Sevier Valley. The reservoir impounds Otter Creek, a tributary of the East Fork Sevier River, and also stores water diverted from the East Fork through a short canal. It has a storage capacity of 52,700 acre feet (65,000,000 m3). Piute Dam was constructed on the Upper Sevier River between 1908 and 1914, forming Piute Reservoir. The reservoir holds up to 71,826 acre feet (88,596,000 m3) of water for use in the Sevier Valley. Water released from Piute Reservoir is diverted at the Sevier Valley Diversion Dam into the 65-mile (105 km)-long Sevier Valley-Piute Canal. It is one of the longest man-made waterways in Utah, irrigating 20,000 acres (8,100 ha) along the western side of the valley in Sevier and Sanpete Counties. By the early 1900s, the Lower Sevier often dried up below the Juab area, both due to heavy irrigation in the Upper Sevier and a series of drought years. The Deseret Irrigation Company began constructing Yuba Dam at the Sevier Bridge site in 1902, and work continued through 1907. "Nearly every available man and boy in Deseret, Oasis and Hinckley worked at the dam." The dam was originally completed to a height of 60 feet (18 m), and was raised to 90 feet (27 m) between 1913 and 1916. Water rights were sold to three other irrigation districts in the Lower Sevier. Sevier Bridge Reservoir has a capacity of 236,145 acre feet (291,281,000 m3), making it the fourth biggest man-made lake in Utah. Parts of the Upper Sevier, and its higher tributaries and feeder lakes, are good trout waters, particularly in National Forest lands. The basin has native cutthroat trout, and many streams contain introduced brook, brown and rainbow trout. A 20-mile (32 km) stretch of the East Fork in Black Canyon, above Tropic Reservoir, is classified as a Blue Ribbon trout fishery. This stretch was restored by the Utah Division of Wildlife Resources between 1992 and 2006 due to damage from the 1983 flooding. Marysvale Canyon is also known for its trout during the non-irrigation (low water) season, being located in the tailwater of Piute Dam. Fishing is generally poor downstream of Marysvale Canyon due to the warm silty water, numerous diversion structures and degradation of riparian habitat. ^ a b c "Sevier River". Geographic Names Information System. United States Geological Survey. 1979-12-31. Retrieved 2018-05-09. ^ a b "National Hydrography Dataset via National Map Viewer". U.S. Geological Survey. Retrieved 2018-05-09. ^ USGS Gage #10219000 Sevier River near Juab, UT: Water-Data Report 2013. National Water Information System. U.S. Geological Survey. 2013. Accessed 2018-05-09. ^ a b "Boundary Descriptions and Names of Regions, Subregions, Accounting Units and Cataloging Units". United States Geological Survey. Retrieved 2017-05-09. ^ a b c Murphy, Miriam B. "Sevier County". Utah History Encyclopedia. Retrieved 2018-05-09. ^ a b c Van Cott, John W. (1990). Utah Place Names: A Comprehensive Guide to the Origins of Geographic Names : a Compilation. University of Utah Press. ISBN 0-87480-345-4. ^ United States Geological Survey (USGS). "United States Geological Survey Topographic Map: Long Valley Junction, Utah quad". TopoQuest. Retrieved 2018-05-09. ^ a b c d e f Utah Road and Recreation Atlas (Map) (7 ed.). Cartography by Allen, Neil et al. Benchmark Maps. 2017. ^ United States Geological Survey (USGS). "United States Geological Survey Topographic Map: Hatch, Utah quad". TopoQuest. Retrieved 2018-05-09. ^ United States Geological Survey (USGS). "United States Geological Survey Topographic Map: Panguitch, Utah quad". TopoQuest. Retrieved 2018-05-09. ^ United States Geological Survey (USGS). "United States Geological Survey Topographic Map: Bull Rush Peak, Utah quad". TopoQuest. Retrieved 2018-05-09. ^ United States Geological Survey (USGS). "United States Geological Survey Topographic Map: Circleville, Utah quad". TopoQuest. Retrieved 2018-05-09. ^ United States Geological Survey (USGS). "United States Geological Survey Topographic Map: Junction, Utah quad". TopoQuest. Retrieved 2018-05-09. ^ United States Geological Survey (USGS). "United States Geological Survey Topographic Map: Piute Reservoir, Utah quad". TopoQuest. Retrieved 2018-05-09. ^ United States Geological Survey (USGS). "United States Geological Survey Topographic Map: Marysvale, Utah quad". TopoQuest. Retrieved 2018-05-09. ^ United States Geological Survey (USGS). "United States Geological Survey Topographic Map: Marysvale Canyon, Utah quad". TopoQuest. Retrieved 2018-05-09. ^ United States Geological Survey (USGS). "United States Geological Survey Topographic Map: Gunnison, Utah quad". TopoQuest. Retrieved 2018-05-09. ^ United States Geological Survey (USGS). "United States Geological Survey Topographic Map: Scipio North, Utah quad". TopoQuest. Retrieved 2018-05-09. ^ United States Geological Survey (USGS). "United States Geological Survey Topographic Map: Champlin Peak, Utah quad". TopoQuest. Retrieved 2018-05-09. ^ United States Geological Survey (USGS). "United States Geological Survey Topographic Map: Delta, Utah quad". TopoQuest. Retrieved 2018-05-09. ^ United States Geological Survey (USGS). "United States Geological Survey Topographic Map: Red Pass, Utah quad". TopoQuest. Retrieved 2018-05-09. ^ a b c d e f g h i j k l m n o p q r s t u "Introduction" (PDF). Utah State Water Plan - Sevier River Basin. Utah Division of Water Resources. Jun 1999. Retrieved 2018-05-10. ^ "Sevier Lake". Geographic Names Information System. United States Geological Survey. 1979-12-31. Retrieved 2018-05-09. ^ a b c d e f g h i j "System Description". Sevier River Water Users Association. Retrieved 2018-05-09. ^ a b c d e f "Executive Summary" (PDF). Utah State Water Plan - Sevier River Basin. Utah Division of Water Resources. Jun 1999. Retrieved 2018-05-10. ^ "QuickFacts for Richfield city, Utah". U.S. Census Bureau. Retrieved 2018-05-10. ^ a b c d e f g h i j k l m n o p q r s t "The Land and its Earliest Inhabitants" (PDF). History of Millard County. University of Utah, J. Willard Marriott Digital Library. Retrieved 2018-05-10. ^ "Ground Water Quality Discharge Permit UGW410002, Statement of Basis" (PDF). Utah Department of Environmental Quality. Mar 2018. Retrieved 2018-05-10. ^ "Big Rock Candy Mountain". Utah.com. Retrieved 2018-05-10. ^ a b c d e f g h i j k "Fisheries and Water-Related Wildlife" (PDF). Utah State Water Plan - Sevier River Basin. Utah Division of Water Resources. Jun 1999. Retrieved 2018-05-12. ^ a b c "Nevada-Utah Mountains Semi-Desert - Coniferous Forest - Alpine Meadow". Ecological Subregions of the United States. U.S. Forest Service. Retrieved 2018-05-16. ^ a b c "History of Sevier County". Sevier County, Utah. Retrieved 2018-05-10. ^ a b c d e f g Haymond, Jay M. "Sevier River". Utah History Encyclopedia. Retrieved 2018-05-09. ^ a b c d Duncan, Clifford (2000). "A History of Utah's American Indians, Chapter 5". Utah Division of State History. Retrieved 2018-05-10. ^ Baugh, Alexander L. "John C. Frémont's 1843–44 Western Expedition and Its Influence on Mormon Settlement in Utah". Brigham Young University. Retrieved 2018-05-12. ^ "Gunnison Massacre Site". Great Basin National Heritage Area. Retrieved 2018-05-09. ^ "Sevier County". Utah State History. Retrieved 2018-05-10. ^ a b "A Pioneer Story". Bryce Canyon National Park. U.S. National Park Service. Retrieved 2018-05-09. ^ Reeve, W. Paul. "Circleville Massacre, A Tragic Incident in the Black Hawk War". Utah History To Go. Retrieved 2018-05-12. ^ Busk, Judy. "Richfield". Utah History to Go. Retrieved 2018-05-12. ^ Spano, Susan (2008-04-20). "Butch and Sundance". The Los Angeles Times. Retrieved 2018-05-12. ^ "Historical Information". Town of Tropic, Utah. Retrieved 2018-05-09. ^ a b Walker, Roger. "Sevier River Flooding 1983-1984". WaterHistory.org. Retrieved 2018-05-10. ^ Larsen, Leia (2015-10-11). "As Great Salt Lake dries up, Utah air quality concerns blow in". Standard-Examiner. Retrieved 2018-05-10. ^ "Intermountain Power Service Corporation". Intermountain Power Service Corporation. Retrieved 2018-05-11. ^ O'Donoghue, Amy Joi (2017-05-23). "Intermountain Power Project will shutter coal-fired power plant near Delta". Deseret News. Retrieved 2018-05-11. ^ a b "Marysvale Branch". Rio Grande Info. Retrieved 2018-05-12. ^ a b "Historical Info". Piute County, Utah. Retrieved 2018-05-12. ^ Kennedy, J. Michael (1990-06-02). "Utah Miners--Victims of Atomic Age : Those who dug uranium from the earth suffer a high rate of cancer. Though officials had early warnings, they did little to ease the danger. Congress considers compensation". The Los Angeles Times. Retrieved 2018-05-11. ^ "Frequently Asked Questions". Sevier River Water Users Association. Retrieved 2018-05-11. ^ "Otter Creek Dam Rehabilitation". Franson Civil Engineers. Retrieved 2018-05-10. ^ "Piute Reservoir". Utah Fishing Information. Retrieved 2018-05-09. ^ "Sevier Bridge Reservoir (Yuba Lake)". Utah Government Digital Library. Retrieved 2018-05-10. ^ "Fishing Areas Status Report". U.S. Forest Service. Retrieved 2018-05-13. ^ "East Fork Sevier River, Black Canyon". Utah Division of Wildlife Resources. Retrieved 2018-05-13. ^ "Sevier River in Marysvale Canyon". Go Southern Utah. Retrieved 2018-05-13. Wikimedia Commons has media related to Sevier River. The Wasatch Range /ˈwɑːsætʃ/ is a mountain range that stretches approximately 160 miles from the Utah-Idaho border, south through central Utah in the western United States. It is the edge of the greater Rocky Mountains. The northern extension of the Wasatch Range, the Bear River Mountains, extends just into Idaho, according to the Utah History Encyclopedia, Wasatch in Ute means mountain pass or low pass over high range. According to William Bright the mountains were named for a Shoshoni leader who was named with the Shoshoni term wasattsi, since the earliest days of settlement, the majority of Utahs population has chosen to settle along the ranges western front, where numerous river drainages exit the mountains. The mountains were a source of water, timber. Today, 85% of Utahs population lives within 15 miles of the Wasatch Range and this concentration is known as the Wasatch Front and has a population of just over 2,000,000 residents. Salt Lake City lies between the Wasatch Range and the Great Salt Lake, at 11,928 feet, Mount Nebo, a triple peak rising above Nephi, Utah at the southern end of the range, is the highest peak of the Wasatch. In some places the mountains rise immediately from the base elevation of 4,330 feet to over 11,000 feet. Since they top out just below 12,000 feet, Wasatch peaks are not especially high compared to the Colorado Rockies or even the Uinta Mountains, the other main portion of the Rocky Mountains in Utah. However, they are sculpted by glaciers, yielding notably rugged and they receive heavy falls of snow, in some places over 500 inches per year. This great snowfall, with its runoff, made possible a prosperous urban strip of some 25 cities along nearly 100 miles of mountain frontage. The Wasatch Range is home to a concentration of ski areas, with 11 stretching from Sundance in northern Utah County to Powder Mountain. There is one ski resort in the Bear River Mountains, Park City alone is bordered by two ski resorts. Further north, Big Cottonwood Canyon features tricky climbing on quartzite, the canyons are located within 24 miles of downtown Salt Lake City and the year-round paved roadways can reach 5,000 ft higher in elevation above the city within a short distance. Aurora is a city in Sevier County, United States. The population was 947 at the 2000 census, Aurora is predominantly supported by agriculture, coal mining, and the service sector. Most residents commute to one of the communities to work. Children are schooled in Salina at one of the three public schools, current growth in the community is attributed to the growth of business and industry in the region. According to the United States Census Bureau, the city has an area of 1.0 square miles. This climatic region is typified by large temperature differences, with warm to hot summers. According to the Köppen Climate Classification system, Aurora has a continental climate. Aurora was founded in 1875 by Ezra White and three other families along the banks of the Sevier River, auroras settling came under the direction of Brigham Young. He called on families to settle South Central Utah, originally named Willow Bend, the name was changed to Aurora due to the presence of the Northern Lights. The city was moved west two to three miles along the Rocky Ford Canal to avoid the spring flooding accompanied life along the Sevier and this location enabled significant cultivation of the foothills. Those families that settled the region often left comfortable surroundings of Northern Utah to settle what one original resident described as a region without a green tree in sight. Over time however, settlers planted crops and utilized irrigation to create a very beautiful, nestled in the fertile Sevier Valley, Aurora slowly grew as greater numbers of settlers moved west. While growth occurred rapidly in the accompanying communities of Salina and Richfield. Most current residents are able to track their lineage to one of the four founding families of the city, as of the census of 2000, there were 947 people,303 households, and 269 families residing in the city. The population density was 936.1 people per square mile, there were 321 housing units at an average density of 317.3 per square mile. The racial makeup of the city was 97. 68% White,0. 53% Native American,0. 63% Asian,0. 21% Pacific Islander,0. 84% from other races, hispanic or Latino of any race were 1. 37% of the population. 10. 9% of all households were made up of individuals and 6. 6% had someone living alone who was 65 years of age or older, the average household size was 3.13 and the average family size was 3.38. Circleville is a town in Piute County, United States. The population was 505 at the 2000 census, according to the United States Census Bureau, the town has a total area of 9.1 square miles, all of it land. The Köppen Climate Classification subtype for this climate is Dfb, Circleville was originally settled in 1864. The town was named for the shape of the valley in which it is located, the valley is completely circled by mountains except where the Sevier River goes in and out of the valley on the north and south. On Jun 28th,1866, the town was abandoned by the original settlers, a few settlers began to trickle back into the area in 1873 and the town was re-established in 1874 when Charles Wakeman Dalton crossed the mountain from Beaver with two of his wives and family. Circleville became a community on 24 August 1921. Local residents were interested in facilitating the public services which municipal government provides, as of the census of 2000, there were 505 people,172 households, and 132 families residing in the town. 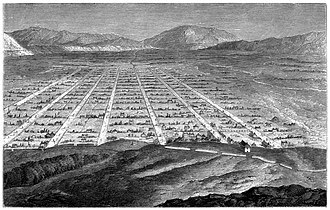 The population density was 55.7 people per square mile, there were 222 housing units at an average density of 24.5 per square mile. The racial makeup of the town was 97. 23% White,0. 20% African American,0. 40% Native American,0. 20% Asian,0. 20% Pacific Islander,0. 99% from other races, and 0. 79% from two or more races. Hispanic or Latino of any race were 4. 36% of the population,22. 1% of all households were made up of individuals and 14. 5% had someone living alone who was 65 years of age or older. The average household size was 2.94 and the family size was 3.45. In the town, the population was out with 34. 7% under the age of 18,5. 9% from 18 to 24,18. 4% from 25 to 44,23. 2% from 45 to 64. The median age was 37 years, for every 100 females there were 98.8 males. For every 100 females age 18 and over, there were 98.8 males, the median income for a household in the town was $32,083, and the median income for a family was $36,875. Males had an income of $25,536 versus $19,063 for females. The per capita income for the town was $12,919, about 8. 7% of families and 12. 8% of the population were below the poverty line, including 15. 2% of those under age 18 and 12. 5% of those age 65 or over. In the Köppen climate system, Continental climates were bordered to the south by Temperate climates or C climates and to the north by Boreal climate or E climates. Köppen defined continental climates as having more than 30 days with continuous snowcover on the ground, Continental climates often have a significant annual variation in temperature. They tend to occur in the latitudes, where prevailing winds come from over land. Continental climates occur mostly in the Northern Hemisphere which has the large landmasses required for this type of climate to develop, most of northern and northeastern China and southeastern Europe, and the central and upper eastern United States have this type of climate. In Continental climates, Precipitation tends to be moderate in amount, a portion of the annual precipitation falls as snowfall, and snow often remains on the ground for more than a month. Summers in continental climates can feature thunderstorms and frequent cool temperatures, the timing of intermediate spring-like or autumn-like temperatures in this zone vary depending on latitude and/or elevation. For example, spring may arrive as soon as early March in the parts of this zone. Annual precipitation in this zone is usually between 600 millimetres and 1,200 millimetres, most of it in the form of snow during winter and it has cold winters and warm summers. Most such areas fit Köppen classifications of Dfa, Dwa or Dfb or Dwb, dry summer continental climates exist in high altitude areas near Mediterranean climates. In some cases, the climate classification of BSk can be considered to be continental as long it has cold winter. Some climatologists use the 0 °C isotherm instead for the coldest month, Continental climates exist where cold air masses infiltrate during the winter and warm air masses form in summer under conditions of high sun and long days. Places with continental climates are as a rule either far from any moderating effects of oceans or are so situated that prevailing winds tend to head offshore. Such regions get quite warm in the summer, achieving temperatures characteristic of tropical climates but are colder than any other climates of similar latitude in the winter. Piute County /ˈpaɪjuːt/ is a county located in the U. S. state of Utah. As of the 2010 census, the population was 1,556, the county seat is Junction, and the largest city is Circleville. The county was named for the Paiute tribe of Native Americans, according to the U. S. Census Bureau, the county has a total area of 766 square miles, of which 758 square miles is land and 7.9 square miles is water. It is the fifth-smallest county in Utah by total area, the population density was 2 people per square mile. There were 745 housing units at a density of 1 per square mile. The racial makeup of the county was 95. 61% White,0. 14% Black or African American,1. 18% Native American,0. 21% Asian,0. 07% Pacific Islander,1. 88% from other races, and 0. 91% from two or more races. 4. 46% of the population were Hispanic or Latino of any race,22. 4% of all households were made up of individuals and 11. 6% had someone living alone who was 65 years of age or older. The average household size was 2.79 and the family size was 3.25. Delta is a city in Millard County, United States. The population was 3,436 at the 2010 census, Delta was originally a railroad switch called Aiken. In 1905 Aiken was renamed Melville when Millard County began plans to set up irrigation, people were given free land to move to the new town as long as they agreed to develop a 40-acre lot. The name was again because of the similarities between Melville and Millville, another town in Utah. The name was changed on May 12,1908 to Burtner, the name was finally changed to Delta on May 11,1911. The name is fitting as the area was a delta of Lake Bonneville. One of these camps, titled Central Utah Relocation Center was located near Delta, the Topaz Museum, located in Delta, works to preserve important sites at the relocation center, and to provide information on the history of the camps. A history of the area is kept and displayed at The Great Basin Museum, John Williams Gunnison was leading a federal surveying team near the Sevier Lake. He was ambushed by the Pahvant Indians and killed, Delta is located at 39°21′11″N 112°34′25″W. According to the United States Census Bureau, the city has an area of 3.2 square miles or 8.3 square kilometres. Delta experiences a climate with hot summers and cold winters. Because of Deltas altitude and aridity, temperatures drop quickly after sunset, daytime highs in the winter are usually above freezing, but nighttime lows drop well below freezing, occasionally falling below 0 °F or −17.8 °C. Delta’s climate is similar to that of Salt Lake City, the Sevier River flows near Delta. The Sevier River is generally used by irrigation before it reaches its eventual end, DMAD are the initials for the Deseret Melville Abraham and Delta water company. Just upstream of Delta, the Sevier River is dammed to provide water, reservoir storage. This reservoir is referred to as the DMAD, agriculture is a major economic force in Delta and the Sevier valley. Downstream of Delta, the Sevier River is dammed again for irrigation and this reservoir is named Gunnison Bend Reservoir, in honor of John Williams Gunnison. The Gilson Mountains are an 11-mile long almost circular, small mountain range adjacent the north terminus of the Canyon Mountains, located in far eastern Juab County, United States. The Gilson Mountains are an ovoid, or elliptical shaped range and it contains a central massif with Champlin Peak, two ridgelines trend from the center to the southwest. From Champlin Peak in the center, Broad Canyon lies between the two ridges. To the northwest another major canyon abuts the center ridgeline, Long Canyon, another ridgeline is formed off the center peak going northeast. Unimproved Gilson Road accesses the canyon on its north, and traverses to an area just northeast of Champlin Peak, the highpoint of the range is Champlin Peak, at 7,504 feet. It is at this point between the two ranges that the Sevier River enters the desert, of the Great Basin, after traversing mountains, plateaus. Abutting the northwest flank of the range is the Little Sahara Recreation Area, the Little Sahara site is slightly larger in area than the Gilson Mountains. U. S.
Panguitch /ˈpeɪŋɡwɪtʃ/ is a city in and the county seat of Garfield County, United States. The population was 1,520 at the 2010 census, and was estimated in 2015 to be 1,481, Panguitch is located in western Garfield County at 37°49′20″N 112°26′5″W, in the valley of the Sevier River. U. S. Route 89 passes through the center of town, leading north 33 miles to Junction, Utah State Route 143 leads southwest from Panguitch 17 miles to Panguitch Lake in Dixie National Forest. According to the United States Census Bureau, the city has an area of 2.1 square miles. Due to the high elevation,6,600 feet above sea level, the settlers initial crops did not mature. At a crisis point, seven men left the community to seek flour, heavy snow forced the abandonment of wagons and teams, and the men finished their rescue mission on foot, reportedly by laying one quilt after another upon the snow to maintain their footing. Due to a conflict with native tribes, the Black Hawk War in Utah, some residents specializing in timber and livestock production were quite successful until economic shifts following World War I. 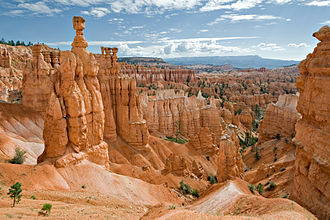 Due to the establishment of Bryce Canyon National Park and the designation of areas as national forests. As of the census of 2000, there were 1,623 people,502 households, the population density was 1,194.0 people per square mile. There were 620 housing units at a density of 456.1 per square mile. The racial makeup of the city was 94. 02% White,0. 49% African American,2. 46% Native American,0. 12% Asian,2. 16% from other races, hispanic or Latino of any race were 2. 90% of the population. 19. 1% of all households were made up of individuals and 11. 2% had someone living alone who was 65 years of age or older, the average household size was 3.05 and the average family size was 3.55. In the city, the population was out with 32. 8% under the age of 18,8. 9% from 18 to 24,23. 2% from 25 to 44,21. 0% from 45 to 64. The median age was 32 years, for every 100 females there were 106.8 males. For every 100 females age 18 and over, there were 111.0 males, the median income for a household in the city was $33,500, and the median income for a family was $39,904. Turkeys in a typical holding pen in northern Sanpete County near Moroni. 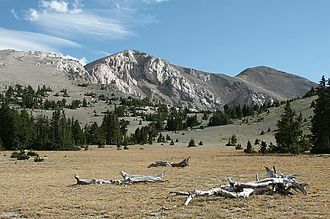 Bald Knoll is the youngest of a group of cinder cones on the SW part of the Paunsaugunt Plateau in southern Utah.